At this point, you've gotta know how important the sour taste is (note: when I say sour, think pleasantly tart as opposed to the battery acid sting of Sour Patch Kids). Just like the textural relief that crisp offers soft, or the more delicious culinary cousin of Icy Hot that is ma-la (numbing-hot) in Chinese cooking--even those first couple of lines of that famous Doors song describe it--contrast is key to keeping interesting things interesting, and even making boring things, well, less boring. And sour is king of keeping things honest and balanced in your mouth. Sound advanced? It isn't. Everyone has had a dill pickled cucumber with a juicy monster burger (or, say, one of the world's great patty melts at Jeri's), tomato soup with grilled cheese, tzatziki sauce on a gyro, kimchi with any/everything. This is why Tabasco is so popular (sure it's the heat, but don't unwittingly discount the co-pilot of vinegar). Sour balances sweet wine and gives it character. It raises coffee from the over-roasted (nay, burnt!) abyss of Starbucks to the delicious, more subtle and complex heights of the smaller roasters that make thinking about coffee so interesting these days. The world of sour is complex, too; different acids are produced/enhanced via different means, whether they are just born that way (citrus), are there waiting to be revealed (wine reduction) or are invited to set up camp (fermentation). Fermentation is one of the trickier ways to get at the acid; time, temperature, attention (but not too much attention) all matter in order to receive the desired results of good bacteria growth and not make one miserably sick. I've been reading The Art of Fermentation by Sandor Ellix Katz. It's not so much a cookbook as an encyclopedia-like volume that explains a ton of different kind of ferments, with some theory and equipment information, but mostly a whole lot of first-hand experience (whether his own or from others who have written to him or published on the web). There's even a great little aside about a friend of his, who got an extra scoop of trouble in federal prison when she was caught trying to ferment the prison coleslaw into sauerkraut, and the mean ol' warden thought it was hooch. The best part is that he readily and humbly admits that he is not a food scientist and claims that he is not an expert--he's just a guy who loves food and embraces the ethic of "the more I learn the less I know." That said, he's had a ton of experience doing so. His earlier book, Wild Fermentation offers more recipes than this one does--this one gives the "why" and a bit of "how," leaving some variables up to you, which, if a bit more challenging that being spoon-fed amounts and ingredients, teaches one so much more. Read this F.o.t.D. post from (gulp) nearly four years ago to understand why I think that. Anyway, back to the merits of sour. Sour refreshes your palate, opens it up to receive other tastes and flavors, splashes cool water on the face of your tongue. Often times, it is accompanied by its good friend crunchy--the sour of textures--which shakes up the round monotony of rich flavors and soft textures. Used as a seasoning agent, sour goes a long way to finish what salt starts--that is, to open your palate up to other tastes. Once you understand salt, and that it is used to season things, to open things up, and not to simply make things salty, you're on the right path to understanding the same thing about sour. If you are making, say, soup for Soup and Bread, and you've salted it well and it's just not unlocking all the other flavors you worked so hard to cultivate--give it some acid. A squeeze of lemon or a dash of good vinegar, and things will open right up. I've currently got a big batch of kimchi fermenting on the counter (see, it's not just sour, spicy and garlicky and funky get invited, too), and some yogurt doing its thing in the closet next to the furnace, as well as Indian-style lime-fermented chiles I picked up from the book above, which Katz picked up from a guy writing as Fried Sig who in turned picked it up from Madhur Jaffrey, of course. Whew! The process is simple. Using a variation on Fried Sig's method due to what I had available, I sliced a variety of chiles--use a good range of heat levels here. Heated a bit of olive oil (original recipe used mustard oil, which has certain preserving qualities, but I had none, and, well...) gently, with some mustard seeds and about five cloves of crushed (but still whole) garlic just until the garlic started to bubble. I let it sit for a few minutes to diffuse flavors, then poured it all over the chiles and added a 2" knob of ginger, peeled and sliced into thin discs. I seasoned with salt and mixed everything, tasting until the salt level was right (the chiles should taste good, nice and salty but of course, not too salty). Then packed it all into a jar. If your friend makes pickles, he'll have one you can borrow. I let it hang out on the kitchen counter for a few days, shaking it now and then, turning the jar upside down, so that everything had a fair shot at being in contact with the liquid being produced by the chiles being cured by the salt. And because of this curing, the chiles shrink in volume. I added the juice of a lime or two, tasting things again, and let the jar continue to do its thing on the counter. Tasting every day, I waited until they attained a tasty level of funk and sourness, and the chiles have since become delicious hot, sour and salty accompaniments to nearly everything I eat. I was a touch worried about the lack of mustard oil, but so far things have worked out. The chiles are in the fridge now, holding a spot for the kimchi as it finishes it's big fermentation at room temperature (mind you, the room is in a cold apartment with high ceilings in Chicago). At any rate, you don't need to run out and buy big books and turn your kitchen into a laboratory/zoo to enjoy the sour taste--there's a lot of great product out there. And you might be more familiar with it than you think. If you've ever put lemon juice or malt vinegar on a fish fry, you can appreciate what I'm saying here. So, invite a pickle to each meal, get some kimchi from your Korean neighbor, or plant a lemon tree. Just don't suffer without the sour! 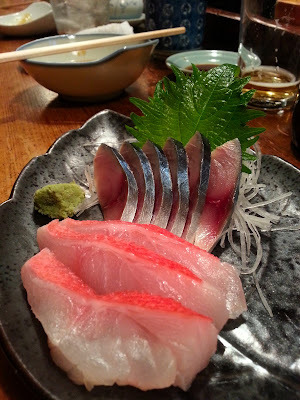 A trip to Tokyo requires a trip to Tsukiji Fish Market (read about it here--their actual website is atrocious). Thing is, my family is in Kyoto and the mountains outside Tokyo, so in all of my trips to Japan I've only been to Tokyo once, and that was when I was a fourteen year old nitwit, up from Kyoto to see a Denver Broncos exhibition game. The pinnacle of culture during that trip was going to a big fancy banquet at which the Broncos were in attendance. I remember having the same jumbly-stomached trepidation I'd had at the 8th grade graduation dance not long before, where I sat in ill-fitting clothes, not talking to the people I finally had such sweet, coveted access to because I was so painfully shy--the difference this time being that these were enormous and scary men as opposed to young and scary girls. So you see, I didn't get a whole lot out of that trip. This time however, Tsukiji was high on the list. 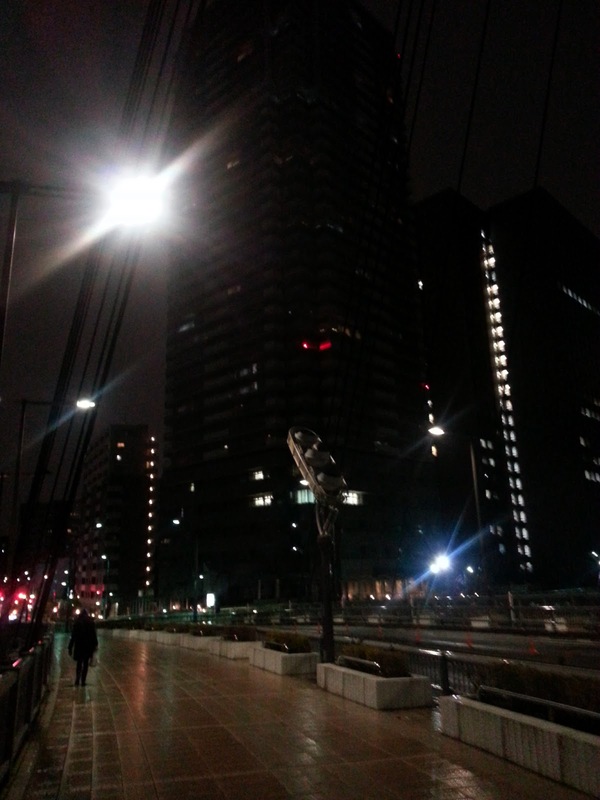 I was fortunate to have a family friend in Tokyo, who has a great apartment--a short two bridge walk from Tsukiji--she rents out that she graciously offered to us for free. 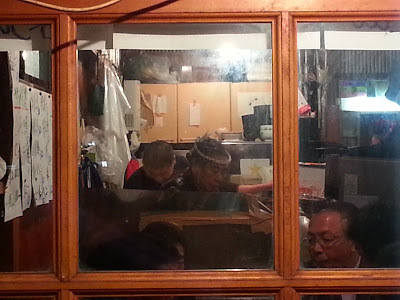 In Japan, free accommodations go a long, long way, further than most places. She offered to "point us in the right direction" from the corner for the convenience store, subway stations, which way to go to get to Tsukiji the next morning; this turned into a mega-brisk walk over the Sumida River into a section called Tsukishima, and through a rather industrial area speckled with tiny little shops selling tsukudani (items such as seaweed or seafood simmered in soy sauce and mirin, which preserves and ups the flavor--talk about umami!). We got a small bit of shio kombu (a thick kelp, usually used to flavor dashi broths, simmered as tsukudani) to snack on along the way, though it's usually eaten with rice, or in onigiri (a rice ball packed with various flavorful fillings taken on the road). As we started weaving in and out of alleyways, the sun began to set, and I realized I was doing something I'd never be able to do on my own--I started to grasp that she wasn't taking us to the Hot Doug's of Tokyo. Before I knew it, we were squeezing into seats shoulder to shoulder with red-faced businessmen in black suits, cigarettes dangling from mouth corners, knocking back shōchū in a small wooden dive littered with paper signs describing, in Japanese kangi, what was available that day. This was the kind of place where even the numbers for the price were in Japanese (i.e. if we wrote out "Five Ninety-Nine" here in the states). Those are easy enough to understand, but meaningless if you don't know if you are ordering the sake or tuna face. Which is essentially the first thing that came out. I saw someone eating large, jagged, mismatched chunks of really red meat as we went in; I thought to myself, "how odd to be eating beef in a place this close to Tsukiji market. And what lean beef!" The glow of an idiot's realization warmed my cheeks as a plate of the same was delivered to our table, with a small amount of wasabi. Knowing that raw beef just does not happen in Japan, and gathering my wits under me, I asked what it was. "Tuna!" Circular motions were made around our host's face. "The cheek!" I gleefully attacked the tuna, and it was obviously some of the freshest, cleanest tuna I'd ever eaten. Chewy--not melt-in-your-mouth like fatty tuna--and a real treat for us mastication fanatics who choose, say, hanger over tenderloin. More chewy=more flavor. And a whole huge plate of it for 500 yen, not too much over 5 bucks! Beer arrived, and we tucked into the next offering: a steamed bass collar. Great, clean, flavorful flesh--but it was the fat under the skin that made this one so amazing. Rich, not fishy, and it gave me the same warm shivers as a good vein of ribeye fat. A quick rearrangement of seats as a group of pretty rough looking older ladies, high on shōchū and green tea (yes, mixed) slid down for a new batch of diners and drinkers. The already rambunctious noise grew, then out came a stew made of beef tripe and intestine--hard to fathom for some, but cooked long and low, and if you can get your head around it, the richness is super comforting on a chilly night. Deep, deep flavors; myriad textures; powerfully satisfying and beefy. Umami falls well short of a proper description of the flavor. Pickles arrived to bring us out of our stupor of indulgence, then yakitori (grilled chicken and scallion skewers) for a grounding familiarity, and more beer. And finally, monkfish liver. Foie gras of the sea. 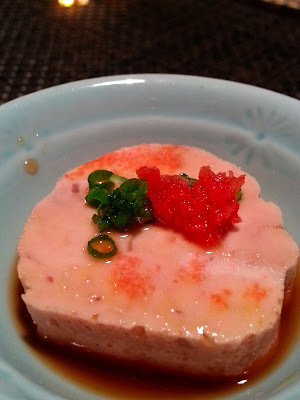 Often times, you'll get a nice little disc of it, rolled like a torchon and steamed, served humbly and delicately in ponzu sauce. Not in this case. This was an enormous chunk, served in a rather oily stew. Just looking at it was a challenge--this was a whole lotta liver. But it was delicious; rich, of course, and not as clean as foie. I took several happy and exuberant bites, then a few courteous bites, then I just plain forced down a few more...and I was done. It was just...so...big. A dozen people could eat this thing and then roll off into the street clutching their bellies. Which is what three of us did. We squeezed back through the crowd--you think Fat Rice is busy and crowded? This place had around 20 seats, and there were about 35 people sitting down. Don't ask me how. Sweatshirt-clad girls delivering food and booze to tables and freshly sliced fish (wrapped in plastic on styrofoam not unlike our packs of ground beef here in the states) to a small table outside for take-away sale split the crowds effortlessly, though not without some helmet-to-helmet contact. Me, I climbed over people to get out--not an easy thing to do, and quite humiliating when you are a 100 kilo white guy. The chef had kept glancing over at me during the meal, most likely thinking of what my liver might taste like, and this was decidedly not the place to pull out the camera and start shooting (a battle I had to have with myself at any restaurant in Japan, with the side arguing "hey--it's going to be a long while before you see this food again" frequently winning out over the "yeah, but there's nothing I can stand less than people taking terrible pictures of their food for several minutes from several angles before even considering eating it" side), so I snapped a quick shot of the chef's face from outside, framed in the door's glass panel. Slowly, I realized that I'd just had one of the great meals. I was dazed from the entire experience, and there was nothing left to do other than stumble away into the night, back over the river, and eventually through the narrow night streets of the Golden Gai, making a now half-hearted effort to find a bar I'd heard was frequented by Wim Wenders, an expert in devastation, but giving up and falling into an anonymous matchbox joint to contemplate the whole thing. 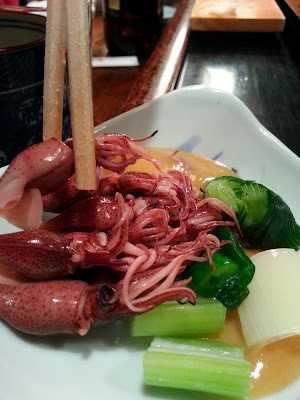 I'd see Tsukiji the next morning, but for now, senses assaulted and ravaged, I sat, and I drank a bit. Try It, You'll Like It, or, How Did I Get Fatter In Japan? One doesn't think of Japan as a place you'd bring an extra 10 pounds back from. Wouldn't the modesty and humility in the culture be reflected in the cuisine? Of course it is--only not for me when visiting my family; they aim to keep the American boy plump and well-fed, and ne'er was the night I climbed out of the bath and into the futon without being amazingly full of food and drink. My time at Fat Rice reemphasized what is too often a background note here in the States: the importance of texture as a player in the complex scheme of something being delicious. To re-quote a friend and believer: "There are two types of people in this world. Those who put chips in their peanut butter and jelly sandwiches, and those who hate life." I remember standing with Old Crazy Hair in the kitchen at Fat Rice as he sliced some tiny jellyfish, moving with his usual frenetic energy to toss them with loads of flavor via chilies and black vinegar and sesame and whatever else. He held a piece out for me to taste, and yeah, the flavoring was delicious, but what I remember the most is the texture--the snap and so-satisfying crunch these little guys had, with nothing backing up the fear of a coelenterate planet we in the States were raised with. My time at Fat Rice also exhausted me (boo-hoo, I know, because the whole crew there and in so many other restaurants is still, and will still be doing it day in day out while some of us gallivant off to foreign lands to behave badly in karaoke bars at 3am) to the point that my palate became an absolutely plowed field, and the week between putting that last Arroz Gordo in the window and my departure to Kyoto allowed said field to rest and relax and prepare to attack some new tastes and flavors and textures. So off I went. The chef here took me horse racing the next day. Think cigarettes and paper bag booze--not tall boots and funny hats. Upon arrival, I was whisked to Gaku, the favorite local izakaya, right on the outskirts of the Suntory distillery in Yamazaki. No whiskey tonight; it was beer, then hot sake, then a steady parade of simple but delicious standards: agedashi tofu (fried silken tofu in a light broth), cured cod roe (snappy and creamy), gyu suji (beef tendon braised until soft and incredibly succulent), tamagoyaki (familiar layers of egg rolled together), tori karaage (essentially fried chicken, super garlicky and crisp), not to mention several various cuts of sashimi, stunningly fresh, more so given my usual (non) proximity to the sea. My brother is famous for (not) discerning types of fish by shrugging and saying "it's a fish!" Though I can see where he is coming from, within the criticism lies the answer; the character of raw fish is extremely subtle, and if one's affinity is toward the heavier, saltier snacks, there isn't going to be much there to pick up. But, if you turn your other senses way down, you'll find that on the lower frequencies, the personality of the fish will speak loudly. 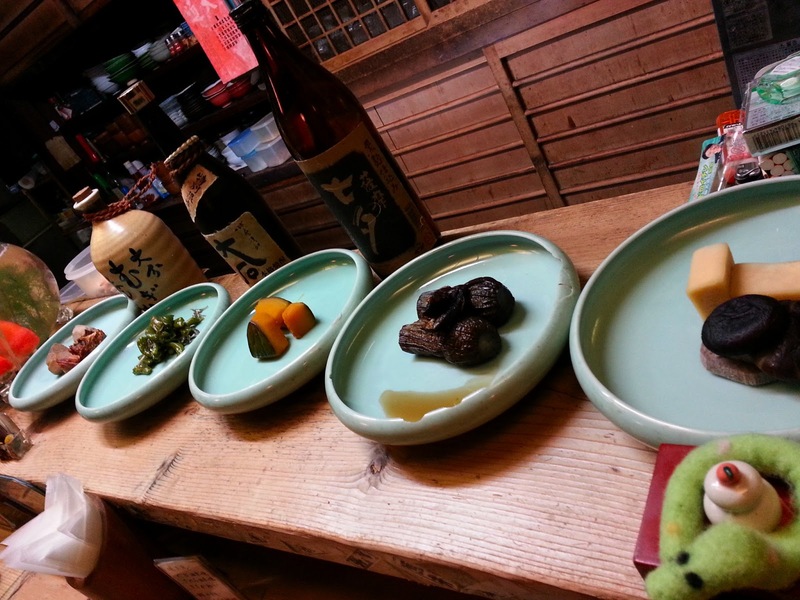 Your palate will gain your other sensual faculties and you'll taste/smell/see/hear/feel the freshness, the smooth melting fat of otoro, the cool salinity of tai, the crunchy snap of the extremely-small whole baby squid. The last tokkuri squeezed of every drop of sake, my brother in law gave us a much coveted ride home (the thought of adding one more train ride to my two flights and blue line scorecard was too much to handle), we all had a groggy nightcap, and I floated off to bed. 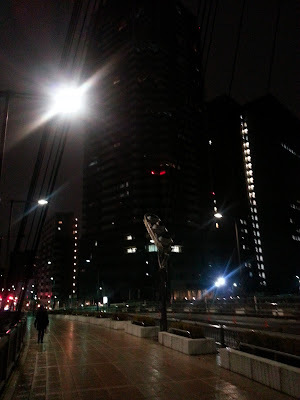 If you find yourself headed to Japan, I have a few pieces of advice: arrive in the evening, or as near to it as possible, stay up late, and don't sleep in forever. You'll be on track and away from jet lag in no time (unlike the trip back this way, which is always so much harder to overcome). Smile at people and say--in whatever busted up poor man's version of Japanese you can muster--things like "arigato," and "sumimasen," and "konnichi-wa". You know, put some effort forth. And most importantly, eat every single thing that is put in front of you. There's a reason people eat what they do; a different definition of delicious for every palate, every culture. Look past the usual bacony suspects of fat and salt and into what makes that particular food great. The worst thing that could happen is it bites you back.